I got parked at the Bute! 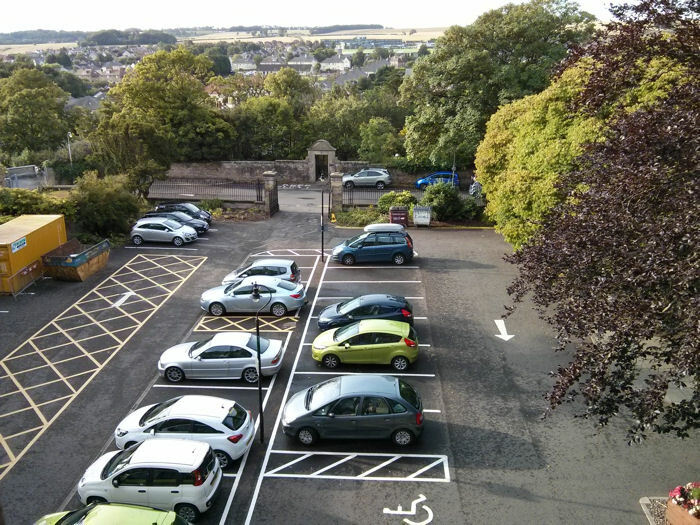 The early bird (or in my case: bloke) catches the parking space at the Bute Building in St Andrews. This was the view out of our office window at 08:19 this morning. My car’s the one with the roof box. Or ‘car attic’ as we like to call it. Posted on Friday 21 August 2015 Thursday 14 December 2017 Categories GeneralTags Bute, car, car park, St Andrews, workLeave a comment on I got parked at the Bute! I must have been the naughty one to be sitting in the corner, facing the wall. Today marked the end of my second week back to work post-virus. Last week I worked three mornings, this week five—although I stayed until 16:30 yesterday to help move my things to our new office in the former Bute medical building. It’s been a very positive week, although I am now really rather tired. Since May we’ve been asking to be co-located with the three members of the digital communications team with whom we’ve been working closely to change how we manage and develop digital and web assets at St Andrews, such as the University website. 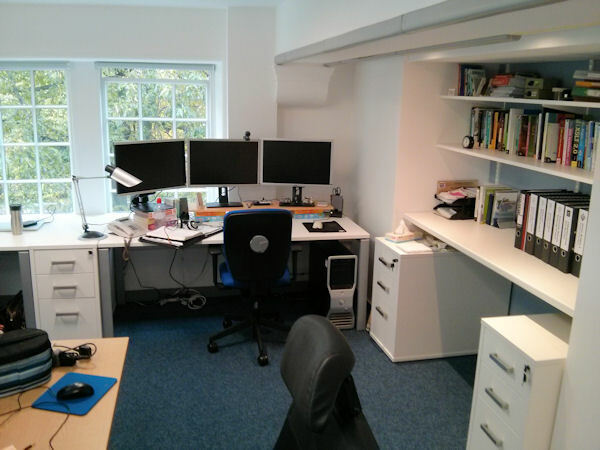 Today we moved into a recently refurbished and spacious office on the third floor of the Bute. It’s a really exciting time to be working in the area of web and digital development; it’s an exciting time to be doing that at the University of St Andrews. It’s an enormous task that we have ahead of us, but I’m so looking forward to it. A few months back I promised that I would write more honest blog posts this year. Last month I blogged elsewhere about mental health in web development. How about a blog post today that combines the two, in a spirit of transparency? 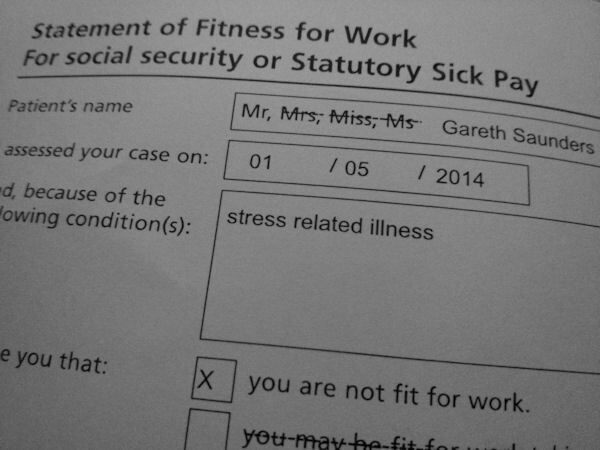 I’ve only just read what he wrote: “stress related illness”. That about sums it up. It turns out that your oral health offers clues about your overall health. And my mouth told my doctor that my general health was terrible and that I needed to be signed off. And when I say “my mouth told my doctor” I don’t mean the speaky bit of my mouth. It all came to a focus this morning in that doctor’s surgery. And I cried. I do feel bad about it. I have colleagues who have said during the last few months, “I don’t know how you keep going?” Today I acknowledged that I can’t just keep going. It also highlights very much, I hope, that our current way of working within the University web team just isn’t sustainable. Something had to give and thankfully it was my physical health first rather than my mental health. But as the GP said it would only be a matter of time if I didn’t stop now. Without exactly saying “a stitch in time saves nine”, my GP responded by saying something along the lines of “a week off in time saves nine”. In the end, after a thorough examination, bloods eventually coaxed from my veins, and the promise of some ‘tasty’ liquorice-flavoured medicine, I relented and agreed to a week. 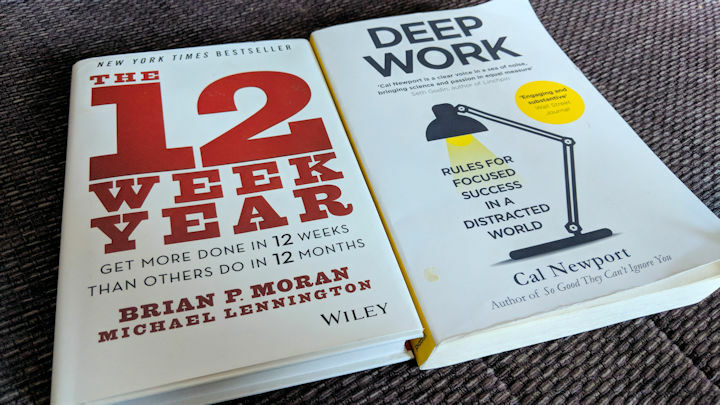 Believe me, the irony is not lost on me: weeks of trying to unsuccessfully negotiate time off at work and when the GP offers it immediately and for (please choose) one or two weeks, I hesitate. So… doctors orders are to rest. I took him at his word, returned home, made a couple of calls, had a spot of lunch and then slept until 3:00pm. Here’s to a few days of healing. 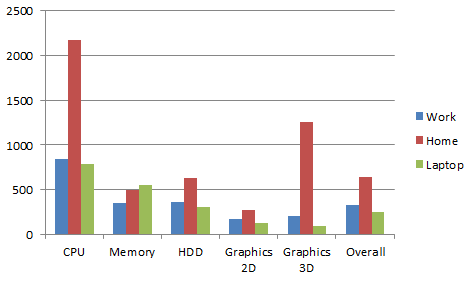 For a while I’ve thought that my PC at work (which I acquired in February 2008) was flagging a little. An upgrade from Windows XP to Windows 7 certainly helped but subjectively I felt that compared with my home PC and my laptop it wasn’t running particularly quickly, as I was waiting quite a while for files to open or applications to start. Now, I’m not particularly familiar with the various benchmarking applications available, or which one is better than the next but I felt it important simply to use the same application on all three computers so that it gave me a fair comparison. 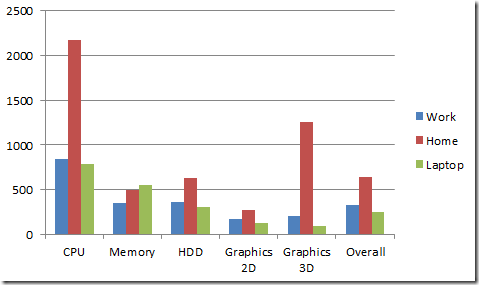 As you can see my suspicions were justified: my work PC isn’t that much faster than my laptop. I got a phone call on Thursday to say that I’m getting a new PC ordered for me at work.